For the Chinese film, see Duckweed (film). Duckweeds, or water lenses, are flowering aquatic plants which float on or just beneath the surface of still or slow-moving bodies of fresh water and wetlands. Also known as "bayroot", they arose from within the arum or aroid family (Araceae), so often are classified as the subfamily Lemnoideae within the Araceae. Other classifications, particularly those created prior to the end of the 20th century, place them as a separate family, Lemnaceae. 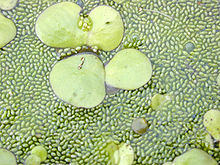 Close-up of two different duckweed types: Spirodela polyrrhiza and Wolffia globosa: The latter are less than 2 mm long. These plants have a simple structure, lacking an obvious stem or leaves. The greater part of each plant is a small organized "thallus" or "frond" structure only a few cells thick, often with air pockets (aerenchyma) that allow it to float on or just under the water surface. Depending on the species, each plant may have no root or may have one or more simple rootlets. Reproduction is mostly by asexual budding (vegetative reproduction), which occurs from a meristem enclosed at the base of the frond. Occasionally, three tiny "flowers" consisting of two stamens and a pistil are produced, by which sexual reproduction occurs. Some view this "flower" as a pseudanthium, or reduced inflorescence, with three flowers that are distinctly either female or male and which are derived from the spadix in the Araceae. Evolution of the duckweed inflorescence remains ambiguous due to the considerable evolutionary reduction of these plants from their earlier relatives. The flower of the duckweed genus Wolffia is the smallest known, measuring merely 0.3 mm long. The fruit produced through this occasional reproduction is a utricle, and a seed is produced in a bag containing air that facilitates flotation. One of the more important factors influencing the distribution of wetland plants, and aquatic plants in particular, is nutrient availability. Duckweeds tend to be associated with fertile, even eutrophic conditions. They can be spread by waterfowl and small mammals, transported inadvertently on their feet and bodies, as well as by moving water. In water bodies with constant currents or overflow, the plants are carried down the water channels and do not proliferate greatly. In some locations, a cyclical pattern driven by weather patterns exists in which the plants proliferate greatly during low water-flow periods, then are carried away as rainy periods ensue. Duckweed is an important high-protein food source for waterfowl. The tiny plants provide cover for fry of many aquatic species. The plants are used as shelter by pond-water species such as bullfrogs and fish such as bluegills. They also provide shade and, although frequently confused with them, can reduce certain light-generated growths of photoautotrophic algae. Duckweed is also eaten by humans in some parts of Southeast Asia. As it contains more protein than soybeans, it is sometimes cited as a significant potential food source. Some initial investigations to what extent duckweed could be introduced in European markets show little consumer objection to the idea. The plants can provide nitrate removal, if cropped, and the duckweeds are important in the process of bioremediation because they grow rapidly, absorbing excess mineral nutrients, particularly nitrogen and phosphates. For these reasons, they are touted as water purifiers of untapped value. The Swiss Department of Water and Sanitation in Developing Countries, associated with the Swiss Federal Institute for Environmental Science and Technology, asserts that as well as the food and agricultural values, duckweed also may be used for wastewater treatment to capture toxins and for odor control, and that if a mat of duckweed is maintained during harvesting for removal of the toxins captured thereby, it prevents the development of algae and controls the breeding of mosquitoes. The same publication provides an extensive list of references for many duckweed-related topics. These plants also may play a role in conservation of water because a cover of duckweed will reduce evaporation of water when compared to the rate of a similarly sized water body with a clear surface. Despite some of these benefits, because duckweed thrives in high-nutrient wetland environments, they can be seen as a nuisance species when conditions allow them to excessively proliferate in environments that are traditionally low in nutrients. This is the case within the Everglades, where surface runoff and agricultural pollution have introduced increased levels of nutrients into an otherwise low-nutrient wetland system, which allows fast growing species such as duckweed to establish themselves, spread, and displace other native species such as sawgrass. Duckweeds belong to the order Alismatales and the family Araceae. (a) is a phylogenetic tree based on ribulose-1, 5-bisphosphate carboxylase large-subunit genes. (b) is a schematic ventral view of Spirodela, to show the clonal, vegetative propagation of duckweeds. Daughter fronds (F1) originate from the vegetative node (No), from the mother frond F0 and remain attached to it by the stipule (Sti), which eventually breaks off, thereby releasing a new plant cluster. Daughter fronds may already initiate new fronds (F2) themselves before full maturity. Roots are attached at the prophyllum (P). (c) shows the progressive reduction from a leaf-like body with several veins and unbranched roots to a thallus-like morphology in the Lemnoideae. The duckweeds have long been a taxonomic mystery, and usually have been considered to be their own family, the Lemnaceae. They primarily reproduce asexually. Flowers, if present at all, are small. Roots are either very much reduced, or absent entirely. They were suspected of being related to the Araceae as long ago as 1876, but until the advent of molecular phylogeny, testing this hypothesis was difficult. Starting in 1995, studies began to confirm their placement in the Araceae and since then, most systematists consider them to be part of that family. Their position within their family has been slightly less clear, but several 21st-century studies place them in the position shown below. They are not closely related to Pistia, however, which also is an aquatic plant in the family Araceae. The genera of duckweeds are: Spirodela, Landoltia, Lemna, Wolffiella, and Wolffia. Duckweed genome sizes have a 10-fold range (150 to 1,500 MB), potentially representing diploids to octaploids. The ancestral genus of Spirodela has the smallest genome size (150 MB, similar to Arabidopsis thaliana), while the most derived genus, Wolffia, contains plants with the largest genome size (1,500 MB). DNA sequencing has shown that Wolffiella and Wolffia are more closely related than the others. 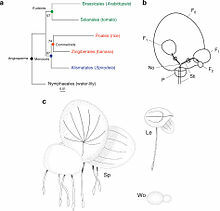 Spirodela is at the basal position of the taxon, followed by Lemna, Wolffiella, and Wolffia, which is the most derived. To identify different duckweed genomes, a DNA-based molecular identification system was developed based on seven plastid-markers proposed by the Consortium for the Barcode of Life. The atpF-atpH non-coding spacer was chosen as a universal DNA barcoding marker for species-level identification of duckweeds. Research and applications of duckweeds are promoted by two international organizations, The International Lemna Association and the International Steering Committee on Duckweed Research and Applications. In July 2008, the U.S. Department of Energy (DOE) Joint Genome Institute announced that the Community Sequencing Program would fund sequencing of the genome of the giant duckweed, Spirodela polyrhiza. This was a priority project for DOE in 2009. The research was intended to facilitate new biomass and bioenergy programs. The results were published in February 2014. They provide insight into how this plant is adapted to rapid growth and an aquatic lifestyle. Duckweed is being studied by researchers around the world as a possible source of clean energy. In the U.S, in addition to being the subject of study by the DOE, both Rutgers University and North Carolina State University have ongoing projects to determine whether duckweed might be a source of cost-effective, clean, renewable energy. Duckweed is a good candidate as a biofuel because it grows rapidly, produces five to six times as much starch as corn per unit of area, and does not contribute to global warming. Unlike fossil fuels, duckweed removes carbon dioxide from the atmosphere instead of adding it. Duckweed also functions as a bioremediator by effectively filtering contaminants such as bacteria, nitrogen, phosphates, and other nutrients from naturally occurring bodies of water, constructed wetlands, and wastewater. ^ Sculthorpe, Cyril Duncan (1985). The biology of aquatic vascular plants. Koeltz Scientific Books. ISBN 978-3-87429-257-3. ^ Landolt, Elias (1986). Biosystematic investigations in the family of duckweeds (Lemnaceae) Vol. 2: The family of Lemnaceae: a monographic study. – Morphology, karyology, ecology, geographic distribution, nomenclature, descriptions. Zürich: Eidgenössische Technische Hochschule Zürich. ^ Keddy, Paul A. (2010). "Fertility". Wetland Ecology: Principles and Conservation (2nd ed.). Cambridge University Press. p. 79. ISBN 978-0-521-73967-2. Retrieved 7 May 2012. ^ Hutchinson, G. Evelyn (1975). A Treatise on Limnology: Vol. 3: Limnological Botany. New York: John Wiley & Sons. ^ Landesman, Louis. "Dr. Wastewater's Duckweed Application Page". Archived from the original on 27 October 2009. Retrieved 31 January 2012. ^ Appenroth, K.J. ; Sree, K.S. ; Böhm, V.; Hammann, S.; Vetter, W.; Leiterer, M.; Jahreis, G. (2017). "utritional value of duckweeds (Lemnaceae) as human food". Food Chemistry. 217: 266–273. doi:10.1016/j.foodchem.2016.08.116. PMID 27664634. ^ de Beukelaar, Myrthe F.; Zeinstra, Gertrude G.; Mes, Jurriaan J.; Fischer, Arnout R.H. (2019). "Duckweed as human food. The influence of meal context and information on duckweed acceptability of Dutch consumers". Food Quality and Preference. 71 (1): 76–86. doi:10.1016/j.foodqual.2018.06.005. ^ "Duckweed Wastewater Treatment and Reuse for Fodder (West Bank)". Idrc.ca. Archived from the original on 8 June 2011. Retrieved 13 November 2011. ^ Iqbal, Sascha (March 1999). "Duckweed Aquaculture: Potentials, Possibilities and Limitations for Combined Wastewater Treatment and Animal Feed Production in Developing Countries" (PDF). SANDEC Report. 6 (99). Retrieved 31 January 2012. ^ a b c Lidia I. Cabrera; Gerardo A. Salazar; Mark W. Chase; Simon J. Mayo; Josef Bogner; Patricia Dávila (2008). "Phylogenetic relationships of aroids and duckweeds (Araceae) inferred from coding and noncoding plastid DNA" (PDF). American Journal of Botany. 95 (9): 1153–1165. doi:10.3732/ajb.0800073. PMID 21632433. Archived from the original (PDF) on 11 May 2013. ^ Wang, Wenqin; Kerstetter, Randall A.; Michael, Todd P. (2011). "Evolution of Genome Size in Duckweeds (Lemnaceae)". Journal of Botany. 2011 (570319): 1–9. doi:10.1155/2011/570319. ISSN 2090-0120. Retrieved 2 August 2012. ^ Wang, Wenqin; Messing, Joachim; Badger, Jonathan H. (2011). "High-Throughput Sequencing of Three Lemnoideae (Duckweeds) Chloroplast Genomes from Total DNA". PLoS ONE. 6 (9): e24670. doi:10.1371/journal.pone.0024670. PMC 3170387. PMID 21931804. ^ Hollingsworth, P. M.; et al. (July 2009). "A DNA barcode for land plants" (PDF). Proceedings of the National Academy of Sciences. 106 (31): 12794–12797. doi:10.1073/pnas.0905845106. PMC 2722355. PMID 19666622. Retrieved 2 August 2012. ^ Wang, Wenqin; Wu, Yongrui; Yan, Yiheng; Ermakova, Marina; Kerstetter, Randall; Messing, Joachim (2010). "DNA barcoding of the Lemnaceae, a family of aquatic monocots" (PDF). BMC Plant Biology. 10 (1): 205. doi:10.1186/1471-2229-10-205. PMC 2956554. PMID 20846439. Retrieved 2 August 2012. ^ "Duckweed genome sequencing has global implications. E! Science News". Esciencenews.com. 8 July 2008. Retrieved 13 November 2011. ^ Wang, W. et al. The Spirodela polyrhiza genome reveals insights into its neotenous reduction fast growth and aquatic lifestyle. Nat. Commun. 5:3311 doi: 10.1038/ncomms4311 (2014). ^ Michael, Todd P. "Genome sequencing of the duckweed Spirodela polyrhiza: a biofuels, bioremediation and carbon cycling crop" (PDF). Archived from the original (PDF) on 3 October 2011. Retrieved 7 May 2012. ^ "Researchers Find Fuel in Odd Places". Ncsu.edu. Retrieved 13 November 2011. ^ Sims, Bryan. "Duckweed Quacks Volumes of Potential". Biomassmagazine.com. Retrieved 13 November 2011. ^ "Duckweed a possible solution to energy needs, researchers say". Pressofatlanticcity.com. 3 May 2010. Retrieved 13 November 2011. ^ "Carbon Neutral Energy". Americanenergyindependence.com. Retrieved 13 November 2011. ^ "Duckweed Genome Sequencing Has Global Implications. Pond scum can undo pollution, fight global warming and alleviate world hunger". News.rutgers.edu. 8 July 2008. Retrieved 13 November 2011. ^ John W. Cross. "Practical Duckweed: Application Areas and Sponsors". Mobot.org. Retrieved 13 November 2011. ^ Knibb, Wayne (July 2001 – June 2004). "Bioremediation of aquaculture waste and degraded waterways using finfish". Queensland Government Department of Primary Industries & Fisheries Tools. Archived from the original on 20 October 2007. Retrieved 6 February 2012. Wikimedia Commons has media related to Lemnoideae. The Charms of Duckweed by John W. Cross. Lemnaceae in Watson, L. and M.J. Dallwitz (1992 onwards). The families of flowering plants: descriptions, illustrations, identification, information retrieval. Version: 3 May 2006.